In a move that brought gasps of surprise, grumbling and in some quarters even shock from attending journalists and dignitaries, the Nobel committee awarded the Nobel Peace Prize to President Obama. “Astonishment” was another word used. According to reports when David Axelrod, Obama’s senior advisor was told that people around the world were “stunned” by the announcement, Axelrod reportedly replied ” so were we”. Reuters has reported the reviews and reactions around the world have been mixed with many feeling Obama hadn’t accomplished anything to deserve the prize. The Associated Press reported that “much of the world praised the decision” but offered no statements from world leaders to support that. Nobel committee chairman Thorbjoern Jagland replied to the criticism by saying Obama was given the award based on what he has tried to accomplish over the last year but many rejected that idea as a basis for giving the award citing no actual accomplishments. While acknowledging that Obama hasnt accomplished anything so far by way of peace in any of the troubled areas of the world, there is evidence that this has as much to do with an international repudiation of George W, Bush as anything else. Massimo Teodori, Italy’s top expert in US history said as much saying it was a reaction to the “antagonistic” polices of George W. Bush. In an unusual turn, the chairman of the Nobel committee felt the need to issue a statement defending the decision of the committtee. Eugen Rogan, Director of Middle East studies at Oxford in England, one who felt the award was premature said of Obama “He hasnt’ done anything yet”. Even those praising the award like Desmond Tutu talked about “the promise” of what Obama might be able to do rather than anything accomplished. In an AP article written by Gregory Katz of the Associated Press Katz said the award was “praised by much of the world”, but the only quotes of praise came from Desmond Tutu and people in the home town of Obama’s father in Kenya. Elbaridi of the IAEA prasied the decision but, contrary to the assertion in the AP article, most of the reaction has been negative. There also has been no public statements of congratulations from the UK, France, Russia or Germany where it is late afternoon. They are sure to eventually issue statements of congratulations but in the language of international diplomacy the fact that there has been no official statements of congratulations sends a message of its own that the reaction is less than enthusiastic. The award is sure to have at least momentary positive political consequences for Obama at home where his approval numbers has been sagging. And its possible he will be able to use this as political capital to get health care reform through congress. It was only a week ago that many Republicans were cheering Obama’s failure to bring the Olympics to Chicago, seeing it as a political victory for them. 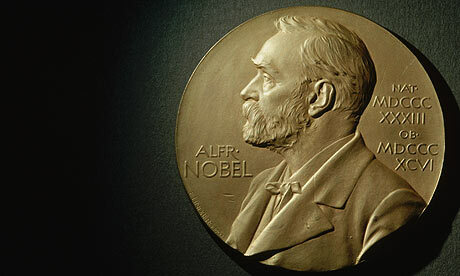 Winning the Nobel Prize will be a blow to the Republicans politically and practically and will make, at least in the short term, attacks on Obama less effective if they should choose to continue to attack at all. Also much to the Republicans chagrin, Obama becomes the third Democrat this decade to win the Nobel Prize, joining Al Gore in 2007 for his work on climate change and Jimmy Carter in 2002.